I’m not a fan of John Water’s movies, but I am a fan of the man. Once I began to see him in interviews I got the impression he’s a really nice guy and an entertaining one to talk to. Not to mention a calming presence to be around. 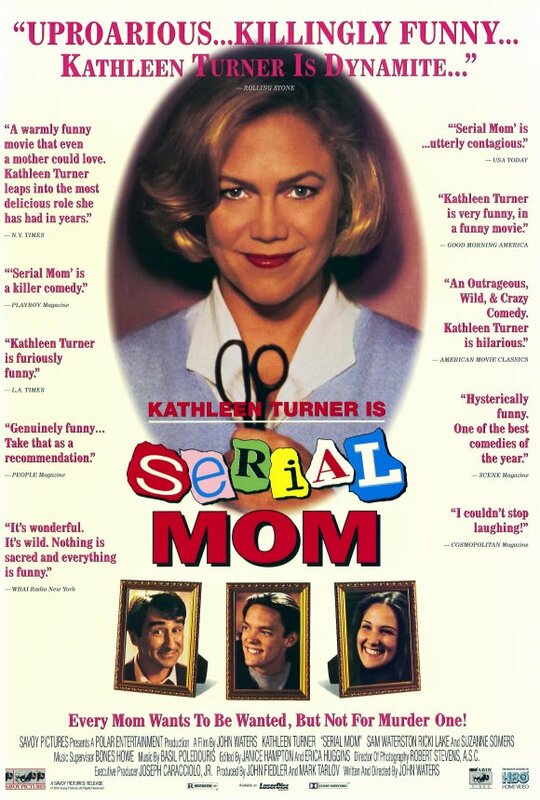 Then came this weird, little flick called, Serial Mom. I caught it out of curiosity on cable in 1995 and ended up loving it! In the new extra Shout! Factory created for this blu-ray, Waters describes the movie as a true crime satire, and that’s pretty much what it is. If aliens came down and asked for a quick education on the correlation between celebrityism (yup, looks like I just created a new word) and crime, I’d show them this movie. Obviously, it’s exaggerated, but that was then, now a lot of what happens in the second part of the movie seems so sadly plausible nowadays, and I mean plausible in the same satiric sense the movie portrays it. The O.J. Simpson trial is referenced in Water’s talks on some of the extras, having foreseen it, but the newest “killer celebrity” that came to mind as I re-watched it last night was Jody Arias. I can see why now Serial Mom has grown in popularity, it hits on a ‘universal truth’ about mankind as all movies that stand the test of time seem to hit on, be it consciously or subconsciously, and there’s nothing subconscious about Serial Mom. 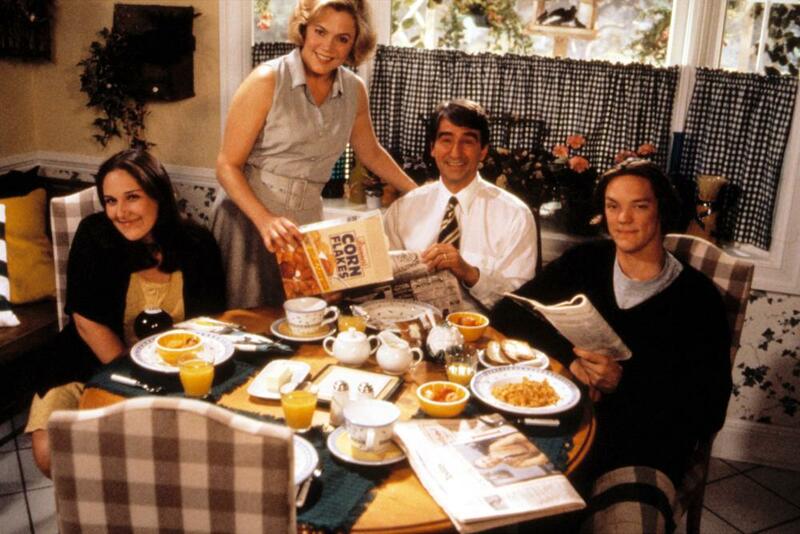 Kathleen Turner plays Beverly Sutphin, wife of Eugene (Sam Waterston) and mother to Misty (Ricki Lake) and Chip (Mathew Lillard). Eugene and Beverly are right out of the classic 50s family model, more so with Beverly. You can even see it in the long, almost dated dresses she wears and in her behavior. The kids are more modern; Chip loves horror movies and works at a video store. Chip has a girlfriend, Birdie (Patricia Dunnock), and Misty is single, though she sets eyes on a couple of dudes in the movie. Beverly is harboring a deadly secret—she’s a psychopath! And as the movie starts she’s been crank calling a neighbor, Dottie Hinkle (Mink Stole), and sending her obscene letters in the mail, all because Dottie stole a parking place from her at the mall. Beverly secretly reads books on serial killers, keeps a scrap book on them and even had a jailhouse friendship with Ted Bundy, as evidenced by a tape Eugene finds and plays recorded during the day Bundy was executed in 1989. Beverly’s first victim is a fly, and it’s obvious she has “problems,” she enjoyed swatting that fly way too much, but her first human victim ends up being Chip’s math teacher, because during one of those parent-teacher conferences he accused her of being a bad parent due to Chip’s love of horror flicks. So, what does she do? She runs him over with her car. Beverly doesn’t become all that concerned with covering her tracks, or taking care there are no witnesses around either. She just gets the urge to kill, goes out and does it, and comes back home like nothing ever happened. Forty-one minutes in and her family already has a pretty good idea she’s killing people. And her reasons for murdering are trivial, they’re circumstances that would make a normal person mad and irritated, but not homicidal. Not rewinding a tape gets a woman beaten to death with a turkey leg; a boy breaking her daughter’s heart gets him skewed by a fireplace poker; an entire family is murdered—not all at the same time, the parents are taken out first (a scissor stabbing and bludgeoning by air conditioner) because, well, they were douchebags to her, then the son later on (death by burning) because he witnessed the turkey leg bludgeoning, and to cap it all off before the credits roll a woman is bludgeoning by phone for wearing white after Labor Day. The first part of the movie is about Beverly killing, and being arrested, and the final act is her trial where she fires her lawyer so she can represent herself and manages to make fools out of all the witnesses the prosecution calls to the stand. Suffice it to say she gets off. During the trial the “celebritysim” takes hold. Hollywood takes notice and wants to make a movie about ‘Serial Mom,’ (Suzanne Somers is cast and cameos in the movie as herself), several books are written along with the required merchandising the kids sell outside the court house. Turner was a good idea for this role, since she’s played various “femme fatales” and “unfaithfuls” throughout her career (my favorite is The Man With Two Brains) and giving her a chance to finally be a full on serial killer is genius, not to mention hilarious via John Waters. 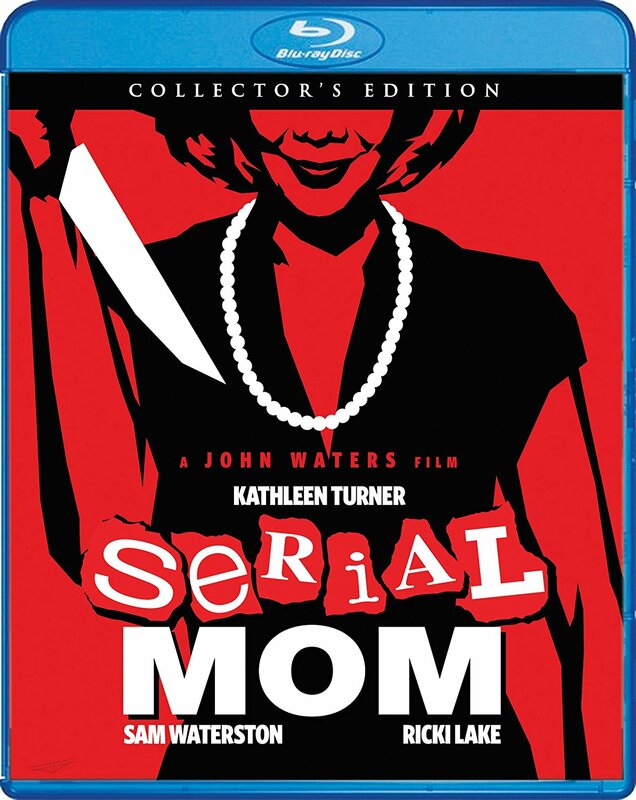 Serial Mom has made it to disc twice, once in 2004 and once in 2008 as a collector’s edition, but this new release from Scream Factory (Shout! Factory’s genre sub-label) marks it’s first appearance on blu-ray here in the U.S! You can buy it on Amazon or on Shout! Factory’s site this coming May 9th! The transfer looks real good! The cinematography in general is really striking because of its suburb setting making the greens pop something fierce. (Note: All previous extras from the 2008 Collector’s Edition have been ported over, with the (NEW) label being an extra created solely by Shout! Factory for this release). 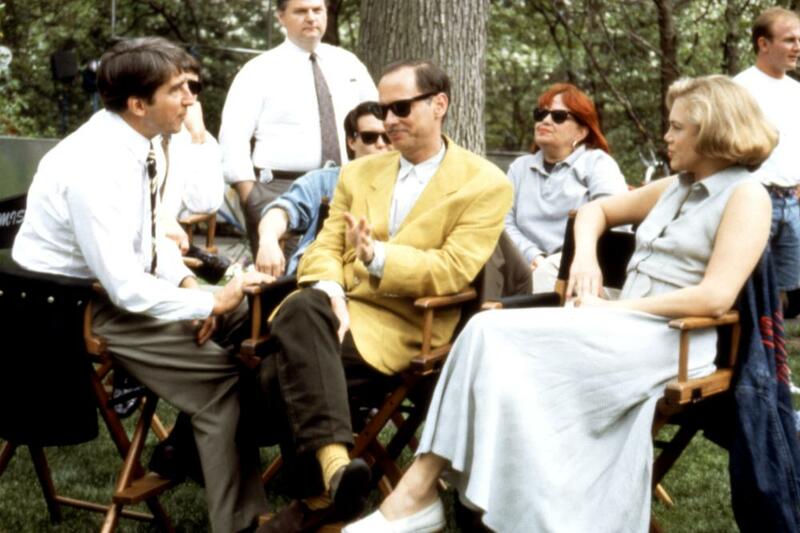 Gallery | This entry was posted in Serial Mom (1994) Blu-ray. Bookmark the permalink.